TOKYO (Reuters) - Japan's export growth slowed in July, with shipments of cars to the United States sinking and as global trade disputes cast doubt over demand for products from the world's third-biggest economy. Exports rose 3.9 percent from a year earlier, Finance Ministry data showed on Thursday, well below the 6.3 percent increase forecast by economists in a Reuters poll and slowing from June’s 6.7 percent increase. Japan's exports to the United States fell 5.2 percent, a second straight decline, paced by a 12.1 percent fall in car shipments. There were no immediate signs that trade tensions with Washington have affected Japan's auto sector, but analysts say external risks are increasing. "While caution is heightening over U.S. trade policy, U.S. car sales are levelling off, causing Japan's car exports to the United States to level off as well," said Takeshi Minami, chief economist at Norinchukin Research Institute. "If capital outflows from emerging economies accelerate on top of this, it would cause a marked slowdown in the global economy, further weighing on Japan's exports." President Donald Trump is pressing Japan and other nations to reduce their trade surpluses with the United States and has threatened to raise tariffs on the critical auto sector after raising them on steel and aluminium. Imports from the United States rose 11.0 percent in July, led by crude oil, motors and liquefied petroleum gas. As a result, Japan's trade surplus with the United States fell 22.1 percent year-on-year to 502.7 billion yen ($4.55 billion). 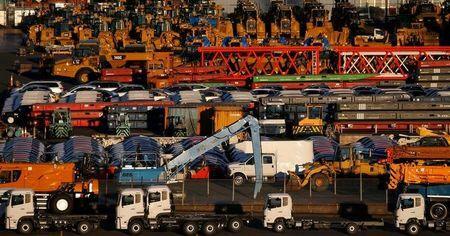 Exports to China, Japan's largest trading partner, rose 11.9 percent in July from a year ago. Shipments to Asia, which account for more than half of Japan's overall exports, rose 8.0 percent, led by semiconductor production equipment and electronics parts for China and sales of steel to Thailand. Overall imports rose 14.6 percent in the year to July, roughly matching economists' median estimate, resulting in a trade deficit of 231.2 billion yen, vastly exceeding the expected 50 billion yen. Thursday's trade figures came after gross domestic product (GDP) data last week showed Japan's economy, the world's third largest, rebounded in the second quarter from a January-March dip. Japan's economy grew at an annualised rate of 1.9 percent in the second quarter on the back of household and business spending, recovering from an earlier contraction.